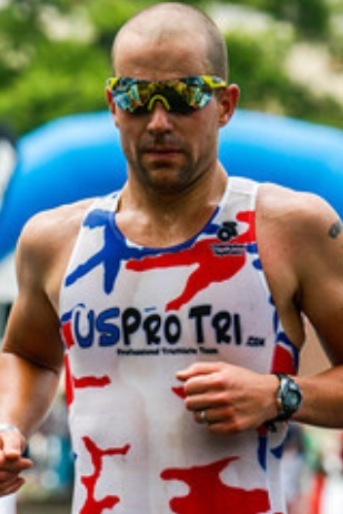 Welcome pro triathlete Tom Wood from Buckhannon, WV, to the Luray Triathlon! Tom, an Operating Room Technologist, will be competing in the Luray Triathlon for the first time. He has decided to do the Luray Double by racing the Luray International Triathlon on Saturday followed by the Luray Sprint Triathlon on Sunday. Tom will compete against a talented field for part of the $5,000 cash prize purse. A) I’m a third-year pro and member of team USPro Tri. I consider myself to be a long course specialist, with personal bests of 4:08 & 8:33 for the Half-Ironman & Ironman distance, respectively. I have a supportive and loving wife, a happy two-year old son, and great friends and family who want to see me achieve my athletic goals. Life is good. A) I’m addicted to being exhausted! A) Triathlon totally changed my life. I believe that the triathlete version of myself is probably one of the best possible versions. A) The chance at some prize money! A) Making the podium in both the sprint and the Olympic race is the goal. There will be plenty of competition to get there, so it should make for an exciting weekend of racing. A) Train consistently and learn from your fellow competitors. A) Well, it’s hard to say for sure. My wife and I are expecting our 2nd child at the end of September, so I’m not fully committing to any other races this year quite yet. Welcome and Good Luck, Tom, in Luray Double!